I realized that this post-Christmas recipe isn't going to be relevant for most of your lives right now (especially not if you're vegetarian). I have 5-6 recipe posts that I've been procrastinating on. 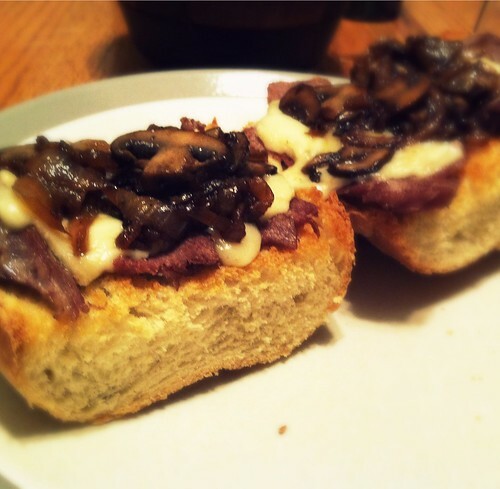 So, in case you have a hefty prime rib to cook this week that will leave leftovers, here is my recipe for cheese steak sandwiches using left over meat. :-) This could be used with freshly cooked ribeye or other steak leftovers. It's simple, it's delicious, it's husband-approved. 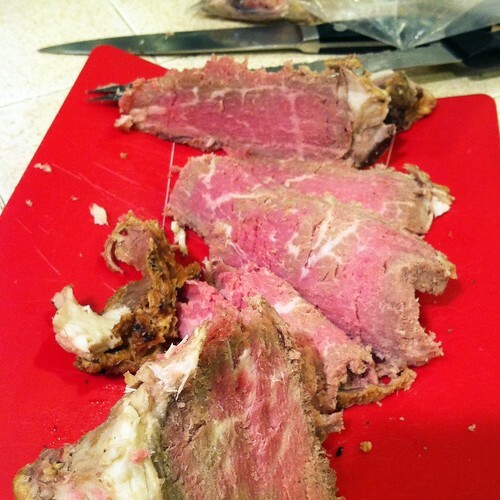 Remove prime rib from the refrigerator at least an hour before an eating to bring to room temperature. Slice very thinly. Preheat oven to 450. Melt 1 tbls of butter over medium high heat and add the onions. 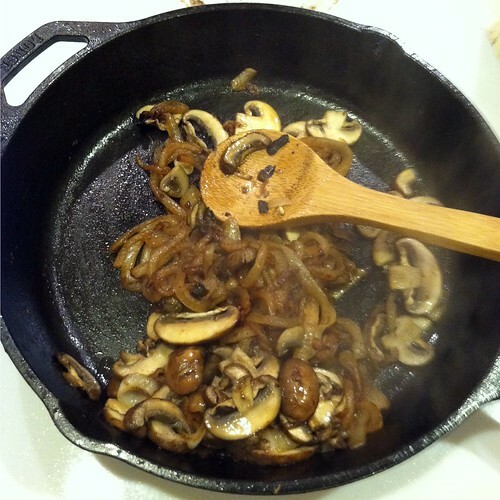 Stir frequently until softened about 7 minutes, add sliced mushrooms and cook until caramelized (15-20 min total). While onions are cooking, cut bread in half, butter it, and toast it face-up in oven for 5-10 minutes. After bread is lightly browned, remove. 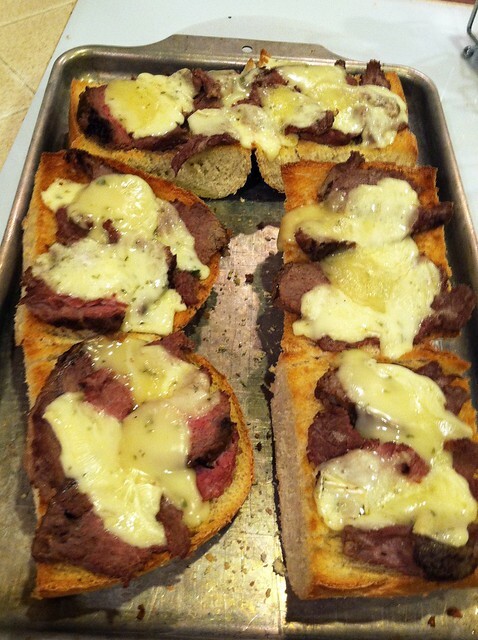 Pile with thinly sliced meat and generous helpings of cheese and return to oven for 5 minutes. 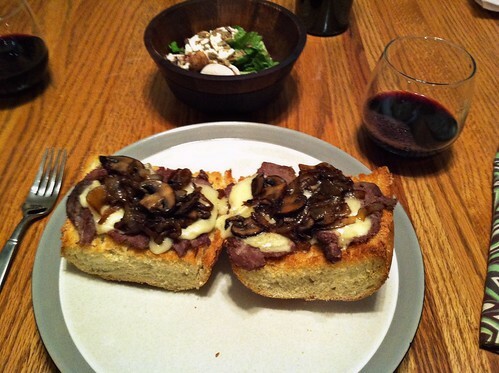 When brie is melted, remove the sandwiches from oven and serve topped with the onion/mushroom mixture, a green salad and red wine!